Asian markets were in two minds whether to follow energy prices or industrial metals after the news from Washington yesterday. The Nikkei (-0.4%) interpreted it as negative and hit stocks from the opening bell, but did not really go anywhere from then onward. The JPY has resumed its downward trend and is this evening flirting with the 110 handle. The currency weakness will eventually roll into equities and stem the downward move as fixed-income begins to unwind. The Hang Seng benefited from the rally in energy prices as the index is quite heavily swayed that way, but also some help from the tech sector. Aussie Dollar continues to trade heavy and that is helping the ASX with another gain today of +0.3%. In India the SENSEX made similar gains (+0.3%), and looks to have more to run. This too is the effect of a weakening currency, the move which appears to have only just started. SENSEX as with the Nikkei look interesting opportunities, but would need to hedge out the currency exposure. 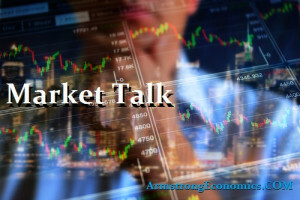 Oil and gas were the big momentum indicators for European markets also, with tech and some better than expected earnings releases aiding the move. The Euro was weaker adding more real world value to the core, but the markets still see difficult times ahead for peripheral economies. Unfortunately, the broken bond market is masking the stress spots, but guess that’s why we will see it played out in the currency market. The move into the US Dollar is becoming all too obvious now with yields, stocks and the currency all moving higher at the same time. Best performer was the UK’s FTSE but it is heavily weighted towards energy, Commodities and Trade (BP, Evraz, BHP, Rio Tinto, Glencore etc.) all over 2.5% better today. US stocks were unsure initially, then energy prices were helped by the surprise drop in stockpiles and stocks started to rally. Refreshingly, it was the broad S+P that led core markets today, but admittedly closely followed by the NASDAQ. Stocks are unabated that treasury yields are pushing higher and even with 10’s closing over 3%. 2’s continue to add value and we saw the 2/10 curve steepen 2bp today. Currency remains the market to watch, especially EM and commodity based economies. Japan 0.05%, US 2’s closed 2.53% (+2bp), 10’s 3.01% (+5bp), 30’s 3.16% (+4bp), Bunds 0.56% (u/c), France 0.79% (-1bp), Italy 1.87% (+1bp), Greece 4.14% (-1bp), Turkey 13.28% (-28bp), Portugal 1.69% (-2bp), Spain 1.29% (-2bp) and Gilts 1.46% (+2bp).